Wave action caused by prevailing high intensity winds can cause severe erosion on restored lake or pond shorelines and impoundment berms. Wetland Sod can provide a double strength approach to address this problem. Our bulrush mats help to dissipate wave impact before it hits the shore while the root systems of other mat mixes (e.g. 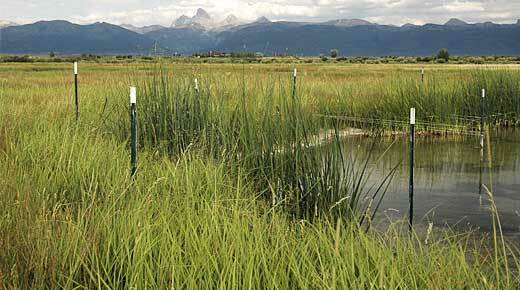 sedges, rushes, spikerushes) directly stabilize shoreline soils.